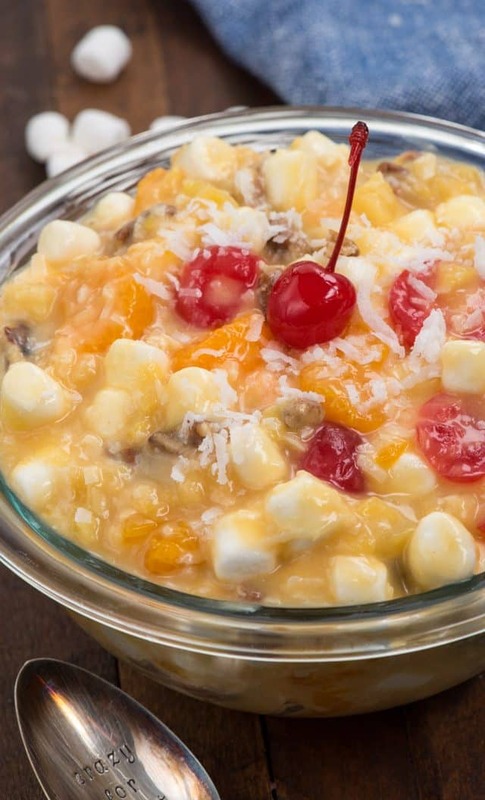 Tropical Ambrosia Salad is an easy ambrosia recipe full of oranges, cherries, and pineapple. It’s made with marshmallows and pudding mix, no sour cream! Thanks to the sponsorship of Almond Breeze, I managed to make ambrosia into a dairy-free no-bake dessert, even better than Grandma used to make! When I was a kid, I thought I didn’t like ambrosia. I’d always wondered what ambrosia was; the term salad would throw me off (what kid likes salad?) Now, as an adult, I think of ambrosia as the best kind of salad: it’s a DESSERT salad! I always think about ambrosia and fluff salads as a summertime recipe. It’s the kind of recipe someone will bring to a potluck or family gathering. Ambrosia is just a twist on a fruit salad; it’s much more fun and exciting. It’s fruit with pudding! All the kids should be running over and inhaling it because a dessert salad is way better than being forced to eat your vegetables! Making this salad reminded me of family gatherings at the park. Even though most of us lived within 20 miles of each other, life was busy. We’d hardly see each other throughout the year, so when my uncle was in town we’d all meet at the park. Someone would grill chicken or hot dogs and everyone else would bring a side dish. Ambrosia or Jell-O salads were usually in appearance! If you search ambrosia or fluff salad, you’ll find there are so many different flavor combinations out there. Orange, pineapple, cherry, strawberry, cheesecake, you name it. Usually the only real thing in common between all those elements are the mini marshmallows, which is one of the reason I think it has the name “fluff”. Mini marshmallows really do fluff up the salad and give it body. 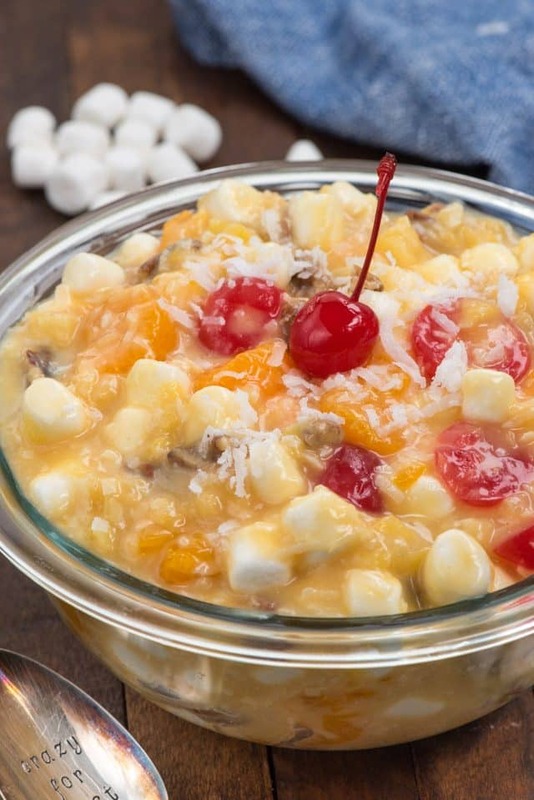 A traditional ambrosia salad is made with crushed pineapple, mandarin oranges, cherries, marshmallows, sour cream and whipped topping. I’ve edited my ambrosia recipe a little bit because I like to make pot-luck recipes dairy-free. We have lots of friends with kids who need the alternative, and I like to be the one that provides that for them. Plus…sour cream has always kind of freaked me out. I know, it’s a condiment issue. Is there such a thing as fear of condiments? If so, I have it. I decided to make my ambrosia salad with pudding mix instead of sour cream and whipped topping. But, you say. Pudding mix has milk! And you’re right, but not this time. This time I made my pudding mix without milk! How do you make pudding mix without milk? You do it by using Almond Breeze almondmilk Unsweetened Original. Until recently, I didn’t realize instant pudding mix could be made with almond milk, but it can be. The trick is just using less almond milk than the milk called for on the carton. It’ll set up nice and easy! This ambrosia salad couldn’t be easier. I’m calling it a tropical ambrosia salad because it’s kind of like tropical fluff: oranges, pineapple, and cherry. Eating it reminded me of being in Hawaii! Since I used pudding, it’s kind of a combination between ambrosia and fluff. The texture is smoother but the flavors are all ambrosia salad! It’s actually kind of like a pineapple fluff salad, but with the flavors of ambrosia. When it comes to almondmilk, I love using Almond Breeze. As you know, it’s my favorite. I love all their flavors, especially the Almond Coconut Unsweetened Vanilla and the Almond Cashew Unsweetened Vanilla. 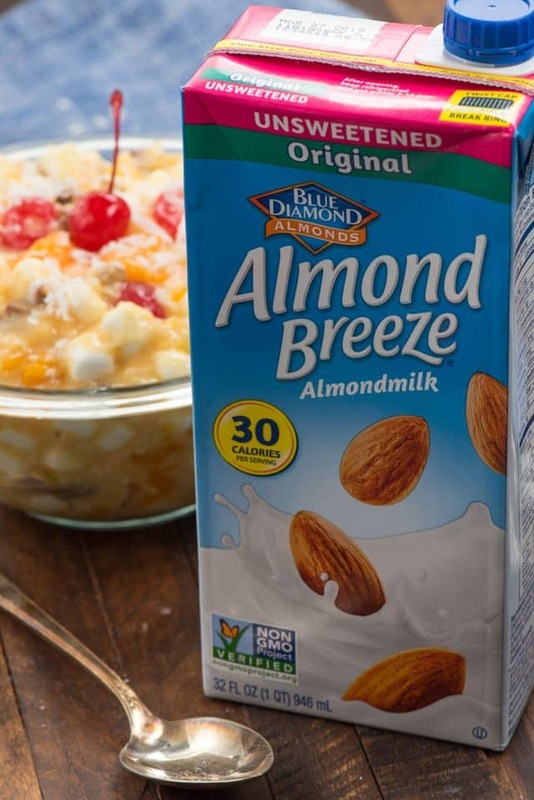 Did you know that Almond Breeze makes a shelf-stable version that’s sold in the regular grocery aisle? It’s great for when you’re on the go or going on a trip. I usually have one or two of these cartons in my pantry at any given time. In this recipe, you can use any flavor Almond Breeze you like and you can use the refrigerated or shelf-stable. Pick your favorite! You can make ambrosia salad a day or two ahead, which is another great thing about this recipe. Keep this dessert salad in the fridge for up to 2 days. That’s such a help when you’re having a party and have other things to make at the same time. Plus, this makes a lot of salad! Be sure to drain your pineapple very well. Crushed pineapple has a lot of juice. It’s best to let it sit in the strainer for a bit. Did you know you can buy stemless maraschino cherries? Be sure to grab those so you’re not picking off the stems. Feel free to use fresh mandarin orange segments if you prefer. I think this would be great with pistachio pudding too – a Watergate salad ambrosia recipe! Tropical Ambrosia Salad is an easy ambrosia recipe full of oranges, cherries, and pineapple. It's made with marshmallows and pudding mix, no sour cream! Whisk pudding and almondmilk in a large bowl. Let sit for 3-5 minutes until thickened. Slice cherries in half. Make sure all fruit is drained well. Stir fruit, marshmallows, coconut, and nuts (if using) into pudding. Chill until set, about 1 hour. 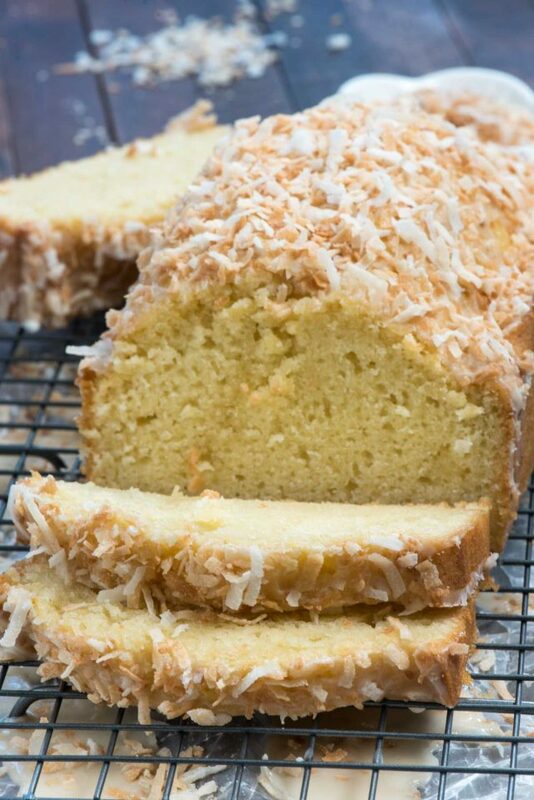 Coconut Pound Cake is perfect anytime you’re craving pound cake! 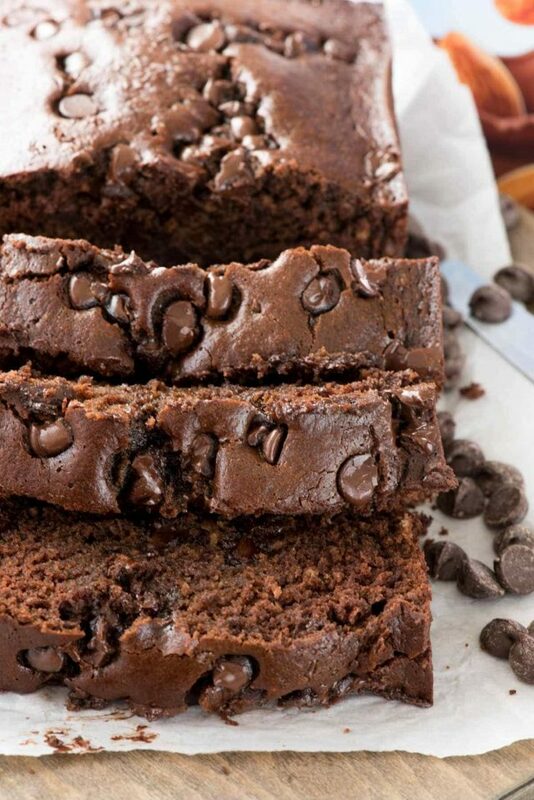 Triple Chocolate Banana Bread is heavenly!